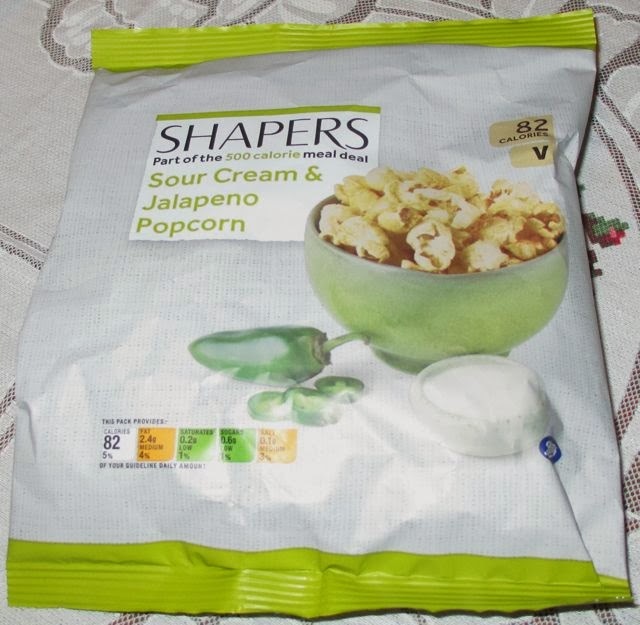 Cinabar is usually the popcorn taster on this blog, but as I'm always looking for alternative snacks to crisps, and hot snacks are my favourites, I thought I'd give Shapers Sour Cream and Jalapeño Popcorn a go. 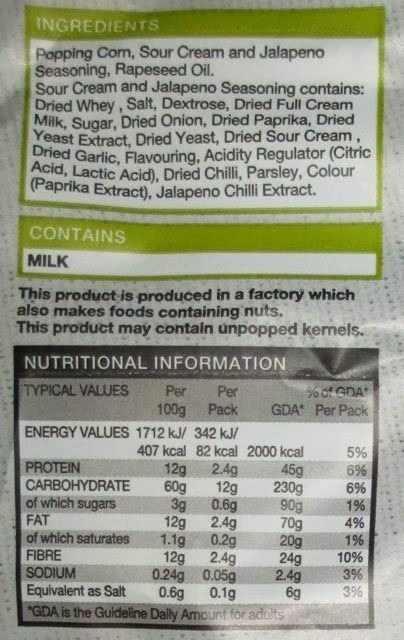 Made for The Boots Company in the United Kingdom for their Shapers range and Vegetarian friendly, the 20g packet had 82 calories, with 2.4g of fat and 0.6g of sugar, which couldn't do my ever increasing waistline much harm. There was chiefly a popcorn smell on opening the packet, no surprises there I guess, and a mild hint of sour cream and onion. The first few tentative bites of this popcorn didn't yield much in the way of flavour. There was not much heat at all or even a wisp of jalapeño. And so in true popcorn tradition I decided to try to fit as much popcorn in my mouth as possible. On the first big mouthful there was a decent hit of paprika with a mild jalapeño heat, finishing with sour cream and onion. The more mouthfuls I tried the more the jalapeño heat started to make my nose tingle a little. There was a pleasurable sour cream and onion aftertaste also. This popcorn flavour was obviously designed for gorging. If you find these on a shelf, I'd recommend buying a few packets and having a contest with someone to see how many you can fit in your mouths each turn. Don't sniff and pick at this popcorn, shove as much in your gob as you can, it may be the only way to get a full taste sensation and just don't worry as they're light as a feather and low in calories!